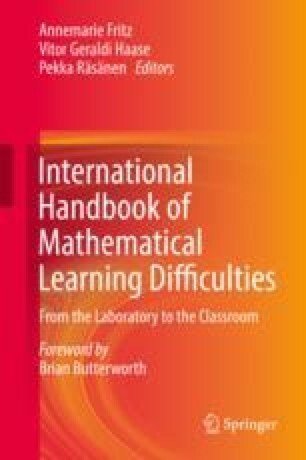 The purpose of this chapter was to consider three frameworks for operationalizing responsiveness to intervention (RTI) as a means of identifying mathematical learning disabilities. We began with the most complex framework, Systemic RTI Reform, and then addressed two increasingly more efficient versions: Embedded RTI and Dynamic Assessment. We described how each framework is conceptualized and operationalized and explain how each attempts to assure quality instruction and to assess response to that instruction. We concluded by comparing the strengths and weaknesses of the three frameworks. Some of the research described in this chapter was supported by Grant R01 HD053714 and Grant R24 HD075443 from the Eunice Kennedy Shriver National Institute of Child Health and Human Development to Vanderbilt University. The content is solely the responsibility of the authors and does not necessarily represent the official views of the Eunice Kennedy Shriver National Institute of Child Health and Human Development or the National Institutes of Health.